Ireland’s ambassador, March 2017. Photo: R Johnson.Although most nuclear-armed governments have made a point of publicly endorsing the goal of multilateral disarmament, they have large amounts of money and prestige invested in getting and keeping nuclear weapons. So, it shouldn’t have surprised anyone that these states dismissed the idea of a legally-binding international treaty to ban such weapons, when the governments of Norway, Mexico, Ireland and Austria put it on the UN agenda in 2010. Over the next seven years, humanitarian arguments for disarmament spread as civil society in 100 countries mobilised under the International Campaign to Abolish Nuclear Weapons (ICAN). A few countries boycotted talks in Oslo, Mexico, Vienna and Geneva, predicting that the nuclear ban process would collapse without them. 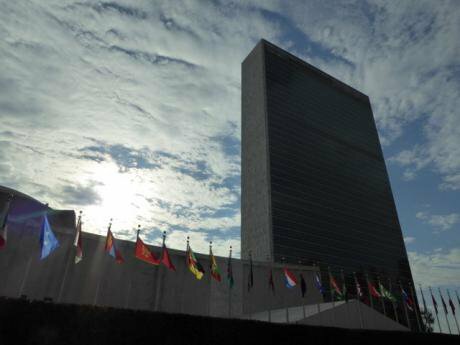 When the UN opened negotiations last month on a "legally binding instrument to prohibit nuclear weapons, leading towards their total elimination," over 130 states participated. With further sessions scheduled for June and July, it's very possible that a nuclear ban treaty will be adopted this year, seven decades after atomic bombs destroyed Hiroshima and Nagasaki and 55 years after the Cuban missile crisis. But what can such a treaty achieve if the UN envoys for Donald Trump, Theresa May and François Hollande have already dismissed it in advance and nuclear-armed governments refuse to come to the table? First, getting rid of nuclear weapons is not just a security matter for the nine states that possess them. Preventing nuclear use and catastrophe are also fundamental security concerns for countries that are not equipped with such weapons themselves, and who want to avoid having to deal with the aftermath if others are mad, bad or stupid enough to unleash them. With the UN's arms control machinery blocked by nuclear-armed states' vetoes and languishing in decades of procedural paralysis, the most achievable strategy for taking disarmament forward is to bring into force a clear, strong prohibition treaty in accordance with international humanitarian law. Such an instrument will only be a start. It won't remove nuclear weapons overnight. Nothing can do that, except perhaps a nuclear war. But the treaty will ban nuclear weapons’ use and other activities that have not been clearly prohibited before. This alone will greatly reinforce global efforts to stigmatise these weapons and accelerate their elimination. As the treaty takes legal effect, it will provide much stronger tools than we have today to criminalise and deter nuclear threats and uses. It will establish more effective legal means to hold to account the leaders and industries that fund, facilitate and profit from such weapons. And it will add to and reinforce existing legal instruments like the 1968 non-proliferation treaty (NPT), the 1996 comprehensive test ban treaty (CTBT), regional nuclear weapon free zone agreements, and relevant UN security council resolutions. United Nations in New York. Photo: R Johnson.The first step is to get the best possible treaty. Summing up the first week of negotiations in March, the chair of the UN talks, Costa Rican ambassador Elayne Whyte said there were high levels of support for "prohibitions against the acquisition, possession, stockpiling, production, manufacture, development, testing, use and threat of use." As with similar treaties, she noted significant support for the treaty to ban activities that assist, encourage or induce others to acquire, develop or use such weapons. Some delegations also wanted to ensure that the ban cover the deployment and stationing of nuclear weapons, and their transit and delivery through national territory, international waters and outer space. 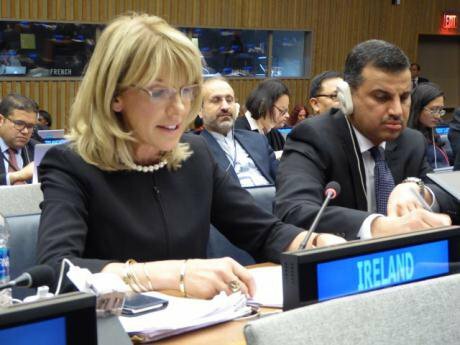 Whyte also highlighted support for positive obligations to ensure the rights of victims of nuclear weapons, including testing, and to address and remedy environmental harm. When the treaty negotiations resume in June, we should expect a process of argument and persuasion on some if not all these elements, so it is useful to think through the legal and political implications of their explicit inclusion or omission. What should the treaty include? All negotiating parties seem to agree that the use of nuclear weapons must be prohibited. But some lawyers are arguing that it would not be necessary to mention the threat of using nuclear weapons, as that would be covered under other laws. In particular, they point to the UN charter, which states in article 2(4): "All members shall refrain in their international relations from the threat or use of force against the territorial integrity or political independence of any state." They also rely on the legal principle that if a certain act is unlawful then threatening to commit that act is also unlawful. That may be legally correct, but it doesn't do much for nuclear politics and international security. First, the UN charter's proscription against the use of force is breached more often than it is honoured. Threatening other countries with force is too often treated as politically normal rather than criminal. Second, unlike other weapons systems, the extraordinarily destructive power of nuclear weapons combined with public revulsion and fear led theorists to come up with a unique formulation of deterrence to legitimise the acquisition and deployment of such weaponry. This doctrine of "nuclear deterrence" that was promoted from the 1950s sanitised nuclear expenditure and policies in nuclear-armed states and enabled the US to deploy nuclear bombs across Europe and enter into nuclear alliances with NATO members, Japan, South Korea and Australia. Nuclear deterrence was promulgated as an insurance policy to ensure the non-use of nuclear weapons. According to politicians and theorists supporting this doctrine, since nuclear use would have such horrific consequences, security can be assured by deploying nuclear arms in a state of readiness that signals an ever-present threat and capability to use them. It follows that if and when this “deterrence” fails, nuclear-armed leaders must be willing and able to fire nuclear weapons in punishing retaliation. As UK prime minister Theresa May told the British parliament in July 2016, "The whole point of a deterrent is that our enemies need to know that we would be prepared to use it." A few months earlier, however, UK defence secretary Michael Fallon had himself acknowledged: "If nuclear weapons are fired, they have failed." As the nuclear ban treaty has gathered momentum, some well-meaning organisations have tried to revive proposals for "no first use" or "no use" declarations. While it would be useful to persuade all states to take their weapons off alert, it would be a mistake to push for such agreements instead of a ban treaty. The time for such declaratory promises has passed. Turning a no first use declaration into any kind of legally binding agreement would create the legal anomaly of permitting other uses of nuclear weapons. Presented as a way to prevent the use of nuclear weapons, a declaratory no use agreement would leave in place the infrastructures for making, deploying, stockpiling, transporting and threatening to use them. The reason why the nuclear ban treaty needs to go further is because the NPT and doctrines of nuclear deterrence – whether based on first use or second strike capabilities – have left in place the justifications, policies and drivers that maintain nuclear threats and arsenals. Manufacturing, developing, testing, deploying, transporting, stockpiling and threatening to use nuclear weapons are the physical and operational activities that make nuclear detonations possible. Financing those activities encourages, assists and normalises nuclear weapons production as an investment opportunity for banks, companies and pension funds. The more weapons are produced, the higher the risks of accidental or intentional detonations. For these reasons, the treaty will be more effective if these activities are clearly banned. In the event that any key activities do not make it into the explicit set of prohibitions, as we've seen in other treaty processes, there are ways to ensure that preamble and negotiating record make clear that all relevant prohibitions and obligations are covered as part of the treaty’s purpose and objectives. It was appropriate, therefore, that the talks in March began with the preamble, where treaties enshrine context, objectives, connections with existing laws and norms, and aspirations for future peace and security objectives that are not yet deemed achievable. The new treaty needs to strengthen international humanitarian law, relevant legal instruments and agreements, and look to the future by promoting environmental protection and human rights, including the rights and needs of people harmed by nuclear weapons. There was widespread support last month for the preamble to underline the treaty's humanitarian aims, the long-lasting and global health and environmental impacts of nuclear weapons, and the imperative to protect civilians and prevent further detonations and suffering caused by nuclear use, development and testing — perhaps using the Japanese term hibakusha. Linking with the UN sustainable development goals (SDGs), there was clear support for proposals from Ireland and Sweden to recognise the gendered impacts of nuclear weapons, as well as for a preambular commitment to the ultimate goal of general and complete disarmament. Some governments argued for the preamble to underscore obligations in the NPT. The question is how to reflect the positive aspects of the 1968 treaty without adversely tying the new process to any of its out-of-date and unhelpful components, such as the special privileges accorded to five cold war "nuclear-weapon states" (China, France, Russia, the UK and US) that are routinely evoked to justify endless nuclear modernisation programmes. In today's world, the 1950s "atoms for peace" commitment also looks hollow to many, but is still enshrined in the NPT's problematic "inalienable right" to "peaceful" nuclear energy, which allows for the production of the fissile materials – plutonium and enriched uranium – that are also used for nuclear bombs. These aspects of the NPT have made it easier for states with nuclear weapons and ambitions to carry on with proliferation, while also providing excuses for nuclear-armed states outside the 1968 treaty – India, Israel, Pakistan and North Korea – to reject relevant UN disarmament measures or agreements that mention it. One way to connect with the good legacy from previous treaties without saddling the new treaty with needless baggage would be to have language that echoes earlier treaties rather than directly attaching to them. It might be wise not to rattle Donald Trump's cage by directly evoking his predecessor's 2009 Prague speech, but President Obama's ringing phrase "peace and security of a world without nuclear weapons" was later adopted by the 2010 NPT review conference and UN security council and general assembly resolutions. It would fittingly frame the nuclear ban treaty as well. Read more articles on 50.50's Towards nuclear non-proliferation platform.